Your roof is not built to last for a lifetime, and many homeowners will ultimately need something new. 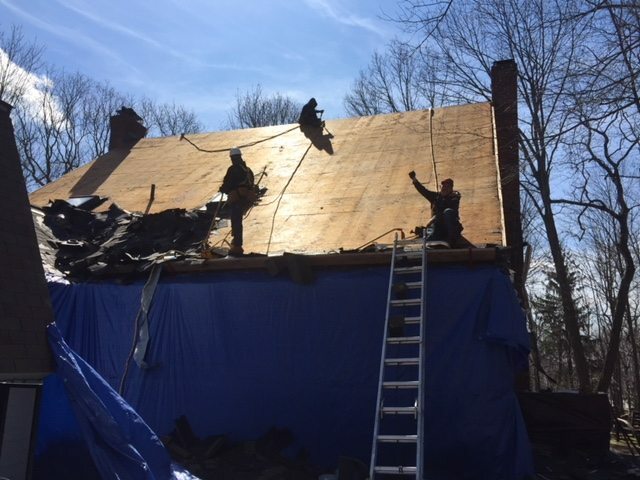 A good roof will usually last for 20 years or so. However, your roofing could suffer damage from the elements or develop problems because there were issues with the original work. Reroofing can be done in one of two ways. You can completely replace the existing roof, or you can choose layover roof in which another layer of shingles is added over the existing roof. There are benefits to a new roof or a layover roof. Water runoff can be a major headache. Too much water draining into your garden or yard can damage your landscaping. Excessive water runoff can also cause foundation damage. The solution to water runoff issues is new roofing. Roof leaks can be patched, but when more and more leaks require repair, it is a sign that you must do more. To stop numerous and constant leaks, reroofing is needed. The outside appearance of your home matters. An old roof can affect the appearance of your home. It is often very surprising to see the impact of a new roof. You can increase the curb appeal of your home with attention to your roof. Your home may be your biggest investment, and there will likely come a time when you will sell your home. Buyers consider the roof of a house when assessing a property. A professional roofing contractor can survey your roof and advise whether a layover roof will get the job done or whether you need to completely replace the existing roof. A layover roof works in some cases, but if your roof has serious damage, you will need a new roof. Have a local professional come out to evaluate your roof.